In the last few months, I’ve been invited to several alumni-student networking events at UConn, my alma mater. At the rough halfway point of my career, how seemingly far I’ve come from my 1.3 first-semester GPA. The event planners gave me guidance for topics of discussion; a consistent one was to tell students about the path I took to get to today. This exercise caused some thinking and reflection, which uncovered some trends. It is, of course, nice to be framed as an example of a “successful” alumnus for future Huskies. In my prep, though, I came to realize that I’m a study in failure. I entered UConn as an engineering major—hence the 1.3—studying computer science, and I left computer science just as the need for that skill was about to skyrocket. I changed majors twice more. I received my degree in journalism at the dawn of an era when everything sustaining journalism—circulation, business models, public trust—was about to collapse. I did a double major in political science and was taking a class in Soviet political systems when the Berlin Wall literally crumbled. The professor came in the next morning, grabbed our textbook, threw it in the empty metal trash can, and said he’d support us trying to get our money back. I went for my MBA later in life and was sitting in a corporate finance class in 2008 when, in the span of a semester, the markets spasmed like never before in my life, and the Great Recession began. By any rational measurement, my educational choices had been extremely unlucky, essentially following one fiasco—or missing one opportunity—after the other. On one level, I should be distraught. My education could be viewed a waste. Maybe my career in tatters, or never getting off the ground. That’s not happened so far, more or less. What I took from my experiences was an appreciation of complexity. I have learned to be nimble in some respects. Semper Gumby, “Always Flexible.” To pick my fights as things fall apart. And they have. And they will. Twenty-five years into my career, I have also learned that life is rarely linear and certainly not animated bluebirds and a glowing, well-lit path. “Success” and “failure” are ying and yang; two sides of the same coin. 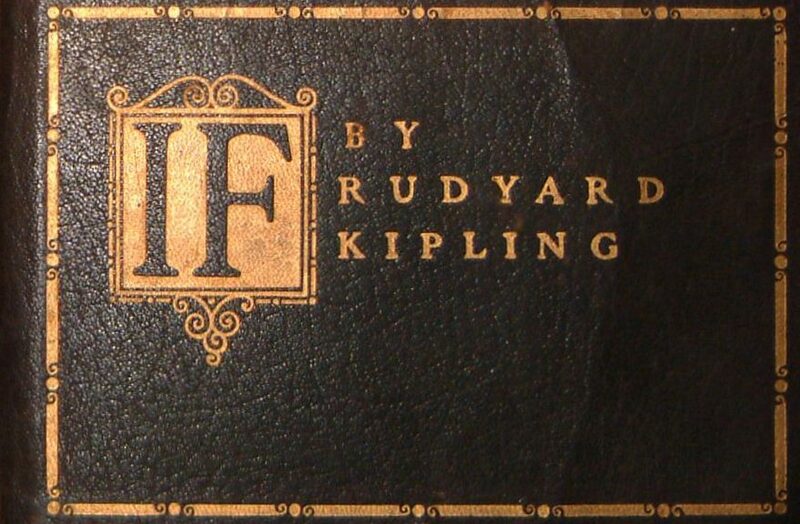 Kipling was on to something. The art of failing that first semester had value. I’d never failed anything. Graduated near the top of my high school class, did good activities, all that. But I failed and failed hard when I hit college. I wish it was because I was having fun; the truth is I just wasn’t smart and adaptive enough. It was good training for everything since. We fail at a lot: jobs, the compasses that guide us, friendships, marriages, parenting, health, life goals, wants and needs. I fail in varying degrees in each of those on a daily basis. We let ourselves down, we let others down, and others let us down. I told the students to get used to failure, that failure is essentially the default setting for life. I don’t think they were expecting to hear that. Perfection provides few lessons for improvement. Failure provides them in buckets. Most of the time, I’ve learned. Sometimes I haven’t. I’ve tried. Failure is an important lens for me to explain my college experience and “path” to them. My degrees made me who I am, in profound ways. In my liberal arts classes, I learned about so many topics I’d never even heard of. Anthropology, for one, which was far from my suburban upbringing. After that 1.3 GPA, it gave me the notion that perhaps engineering, all I’d ever known, was not the only subject I could study. The knowledge of the wider world opened my eyes. My political science education taught me that we are not all that special. That while not all systems of social and cultural organization are equally successful or worthy of emulation, the view of our own horizons is a limited one, which misses so much else. My MBA has been invaluable to whatever real or imagined degree of “success” I’ve had professionally. It opened doors, connections and opportunity. Whatever else comes in my career, I’ll always have those three letters after my name. On a personal note, I was a good ten years older than most of my MBA classmates, and I am exceptionally proud that I went for it, although it came at a price of missed Little League games and family dinners that I can’t ever get back. More failure. Words matter. My professors were relentless in their criticism. Articles I thought were completely fine were judged far lower than completely fine. I was not rewarded for mediocrity. I was told to respect the reader. Details matter. When you had a typo in your article, Professor John Breen took off a full letter grade. We were using very early Macs, and spell-check was turned off. You used a dictionary and the AP Stylebook, and you lived in fear of a typo. The small things are the big things. Dedication matters. Breen told a story about a class assigned to cover a local town meeting. Most of the students left after the main agenda item. One student stayed for the whole meeting and was there to witness and cover a serious medical emergency. Everyone else took the easy path; this student was dedicated to the unglamorous work. Emotion matters. Professor Wayne Worcester taught us feature writing and would play his favorite music for us as we wrote. Work and emotion are intertwined. It’s hard to do anything well without emotion. Passion matters. These were hardscrabble reporters at their core. John Breen was about as close to a movie reporter as I’d ever seen. He used a manual typewriter. He smoked in his office. There were stacks of newspapers literally piled around him. All he needed was a fedora with a piece of paper labeled PRESS sticking out of it. He didn’t “phone in” to teach us. He was a reporter at his core and it showed his passion. Critical thought matters. Breen was my professor for Newswriting 101. In the very first class, he told us, and I quote, “If your mother tells you she loves you, check your sources.” Think for yourself. Dig. Accept nothing at face value. In this day and age, when we are repeatedly lied to, manipulated, allowed to easily retreat into the warm bed of thought that is just like our own, this is a jarring statement. I would argue it’s the most powerful single sentence I’ve ever heard. Critical thought, passion, emotion, dedication, attention to detail and clear communications are invaluable in any life or career. Success takes many forms, and the journey of life is defining what the word means. I’ve failed. A lot. I routinely do. Hopefully always will. For better or worse, it’s made me what I am.